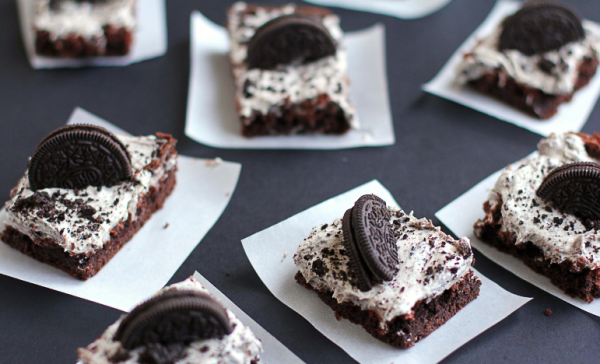 Dangerously Good Oreo Bars Recipe I Warned You! Spray a 9×13 inch baking pan with non-stick baking spray. In a large sized bowl, add chocolate cake mix, 1 egg, and 1 stick melted butter, and whisk together until well mixed. Add the cake mixture to the sprayed pan and pat down into the bottom of the pan. Using a hand mixer and large bowl or the bowl of a stand mixer, add cream cheese and beat until light and fluffy. Bring the mixer to low and add in powdered sugar and vanilla extract. Remove half of the mixture to another medium sized bowl and place to the side. Back in the mixing bowl, beat in one egg, remaining 1/2 stick of melted butter, 1 1/2 tablespoons of cocoa powder. Spread mixed chocolate filling over cake mixture in pan. Bake for 30-35 minutes. Do NOT overbake this cake. It should remain gooey and undone in the center when it is done baking. Allow to cool. In the separate medium sized bowl, add whipped topping and fold in. Lastly, add 1/2 of chopped oreos and fold in. Spread oreo topping on top of gooey cake and sprinkle with remaining chopped oreos. Place tray in the refrigerator for 40 minutes before cutting into squares and serving.